How is the global oil industry dealing with the slump? Experts warn that the UK’s “super-mature” offshore sector faces dire prospects. Around 140 fields are predicted to cease production over the coming decade. Decommissioning costs for late-life fields could outweigh the value of the oil and gas left in the ground. As the global oil price continues to languish, Jeremy Cresswell assesses the industry’s hopes and challenges. These are cathartic times for the global oil and gas industry, where producers have been struggling to make a living in an environment that saw benchmark Brent Blend sink to as low as $28.43 on 20 January this year, with Goldman Sachs forecasting $20 oil. Producers and governments, from Brazil and Venezuela to the Middle East and Russia, have been struggling to cope with over-supply and shrinking demand for fossil fuels. Many experts are warning that the UK’s offshore sector, now classed as “super-mature”, faces dire prospects unless drastic action is taken. Even the British industry’s usually measured trade association Oil & Gas UK (OGUK) has been moved to lay it on the line about the impacts of the most serious oil price slump ever, poor fiscal choices by government and the sector’s own failings. Alan Semple CA, Director at Teekay Corporation and Cobham plc, said: “The energy industry has been significantly impacted by the reduction in the oil price. This has resulted in a very material reduction in capital expenditure in the sector, with the reduction weighted more towards exploration and development activities, but also impacting aspects of ongoing production. “Associated with this, we have seen very significant lay-offs across the industry, in both the operators and to a greater extent the service sector as the service sector scales its cost base to the reduced levels of activity. OGUK published its latest annual activity survey in February. 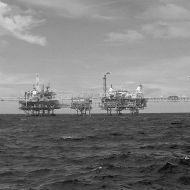 It warned that the sector is at “the edge of a chasm” and that nearly half of currently producing UK Continental Shelf (UKCS) fields are on course to operate at a loss this year. Only £1bn is expected to be spent in 2016 on new projects compared to the annual average of £8bn over the past five years or so. Exploration has sunk to an all-time low and it has been predicted that around 140 fields will cease production over the coming decade. That would drastically reduce the scale of North Sea infrastructure and potentially compromise future development of a sizeable slice of the 20bn barrels presumed to remain in UK waters. This is the third major downturn in the history of the sector and it is by far the most dangerous and prolonged. Recovery from both the 1986 crash and the late 1990s slump took around six to seven years and each required kick-start initiatives. Just ahead of the 2016 Budget, OGUK had made it clear that tax changes were necessary to boost the industry’s competitiveness and restore investor confidence in the UKCS. The Chancellor’s response was to effectively abolish petroleum tax, which applies to fields developed before 1996, and to slash the supplementary charge for newer fields from 20 per cent to 10 per cent. The Budget also included measures to support infrastructure investment through investment and cluster area allowances, and to establish greater certainty over tax relief on decommissioning costs. OGUK’s call for a government-backed loan guarantee scheme to address the sector’s pressing liquidity problems did not appear to have been answered. We have seen the collapses of Iona and First Oil Expro. Who’s next? Maybe the Faroese junior, Atlantic Petroleum, which recently announced it was in default to its lender, Eik Bank, which puts at risk the company’s assets in the Chestnut, Ettrick and Blackbird fields. Meanwhile, there are field and licence forfeitures under way of which hardly a word has been said. Most UKCS licences are held by consortia of companies operating in joint-venture, according to Jill Reid, head of the Aberdeen oil and gas practice with law firm Maclay Murray & Spens. She said: “The default mechanism and the JOAs (joint operating agreements) are such that if a company defaults and can’t pay its share of a cash call, that the other co-venturers will pick up the share of the licence on a pro-rata basis. Clare Munro, Head of Oil and Gas at Brodies, notes that incumbent companies that wish to sell assets may have paid substantial tax – whether corporation tax or petroleum revenue tax – which would more than enable them to fully claim decommissioning tax relief if they were to decommission the assets now. She added: “With CT the tax history sits with the company (not the field) so if the deal is an asset sale there is no guarantee that the purchasing entity will ever pay enough tax to achieve similar levels of relief. Colin Welsh, Head of International Energy Investment Banking at Simmons & Company International, said: “2015 was a very poor year for M&A activity because of the slump in profitability across all segments of the energy complex. It was virtually impossible to assess future earnings, and therefore price deals, because there was no line of sight on when the market might turn around. “With 2016 spending by E&P [exploration and production] companies down again, the industry is undergoing a seismic shift that will see significant numbers of businesses going bust and many others being forced into mergers in order to survive." Colin anticipates a much tighter market to come as the slashing of E&P budgets accelerates production decline rates, with a smaller number of much leaner businesses in both the E&P and service segments. There are companies that see the crunch as an opportunity; like Siccar Point Energy securing its first deal since being established in 2014 with a $500m starter war chest of private equity money. The junior is in the final stage of buying its way into the Mariner heavy oilfield having agreed to purchase a chunk of Japanese corporation JX Nippon’s 28.89 per cent interest. This is a potentially company-making opportunity with a long-time horizon and without a massive call on cash resources as most of the capital spend for Statoil-operated Mariner has been called. Another buyer is upstream petrochemicals heavyweight INEOS which burst onto the North Sea stage last October by agreeing to buy LetterOne’s gas assets owned through the German DEA group for a reported $750m, well short of the $1.2bn asking price. INEOS is eyeing further purchases. Siccar Point and INEOS represent glimmers of light in a landscape where 65,000 jobs are thought to have been lost UK-wide. Alan Kennedy, Aberdeen-based oilfield services UK lead partner with KPMG, said: “The cost reduction measures implemented in 2015 were a case of right-sizing the industry for $50 to $60 oil and came at a significant human cost. This means, he says, that the industry now faces the risk of a “domino effect”. Times are difficult but oil prices will lift and recovery will slowly begin in the hope of at least another 25 to 30 years of North Sea oil. Prosafe is the world’s leading owner and operator of semi-submersible accommodation vessels, operating globally and employing about 850 people. Recently, we have taken actions such as postponing delivery of vessels or negotiating sellers’ credit. We raised private equity and renegotiated banking facilities. Internally, we have implemented efficiency measures including salary reductions for all employees. Even so, there will have to be headcount reductions. In the North Sea (UK & Norway) the operators are trying to preserve cash, cutting expenditure, postponing investment programmes and minimising maintenance plans. In Brazil, state-owned Petrobras faces financial challenges and investigations into alleged corruption. It is in cost-cutting mode, renegotiating contracts and in some cases terminating them. 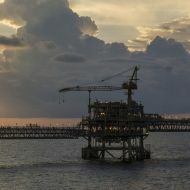 At Pemex, Mexico’s state-owned oil and gas company, a new CEO has been appointed with a strong reputation for “to the bone” cost-cutting. Pemex is renegotiating some contracts and terminating or suspending others. My view on oil price is $50 by the end of 2016 with a similar level for the next couple of years. The challenge for the service sector is the timeline for recovery. First, it requires confidence for operators to plan to start investing again. Then we will have tender processes, which can take some time, and competition for the tenders will be fierce. The “battle cry” for the sector as whole is “do what is necessary to survive the tough times today and prepare for the better times tomorrow”. The number of lay-offs and redundancies within the industry across the globe is significant. There remains little sign of any green shoots and the impact on other industries and markets is clear to see. Cost-cutting and lay-offs prevail. Pressure from customers has driven prices lower but has also created problems for some operators unable to make a commercial return. Bankruptcies are commonplace, particularly in the US. Meanwhile, bank covenants are being repositioned to give operators more breathing space. We have let 40 per cent of our workforce go since 1 January 2015; a similar statistic will apply to most companies within the sector. The majority of our manufacturing facilities are now on less than one shift – four or three day weeks – from three shifts, previously. Our aim is to maintain capability for when the market returns. Dividends are being reduced or cancelled, and capital expenditure by operators on new projects across the globe has been reduced significantly. Eventually, supply and demand should force the price to rise to a level where E&P operators will have the confidence to invest in new projects. Onshore US shale needs around $60, offshore deep water more than $80 and Canadian tar sands above $85. Until these levels are reached and viewed as sustainable then operators may feel nervous about investing. Qaiwan group operates in the Kurdistan Region of Iraq [the finance team are based in Dubai], which has been significantly affected by the low oil prices. The Kurdistan Regional Government is heavily dependent on oil revenue and it has been unable to make regular payments to international oil companies in the upstream sector or to pay salaries to government employees. The economy within Kurdistan has also experienced a significant contraction. The majority of infrastructure projects in the region have either been cancelled or put on hold. The region has witnessed lay-offs, investment cuts in upstream and infrastructure projects in downstream. Some upstream companies have withdrawn from the region, are actively for sale or made virtually no capex investment in 2015. Within the wider Middle East, governments have taken action to reduce their budgets and investments in infrastructure and cut subsidies on items such as fuel. Probably the most significant decision has been the announcement by Gulf Cooperation Council members that VAT will be introduced in 2018. We believe that the current challenges will remain into 2017. The full re-entry of Iran following the lifting of sanctions has still to be reflected in the market and this could cause prices to fall further. Jeremy Cresswell is the Editor of Energy. This article is produced in association with Maclay Murray & Spens LLP and the full version is published in the April 2016 edition of CA magazine.